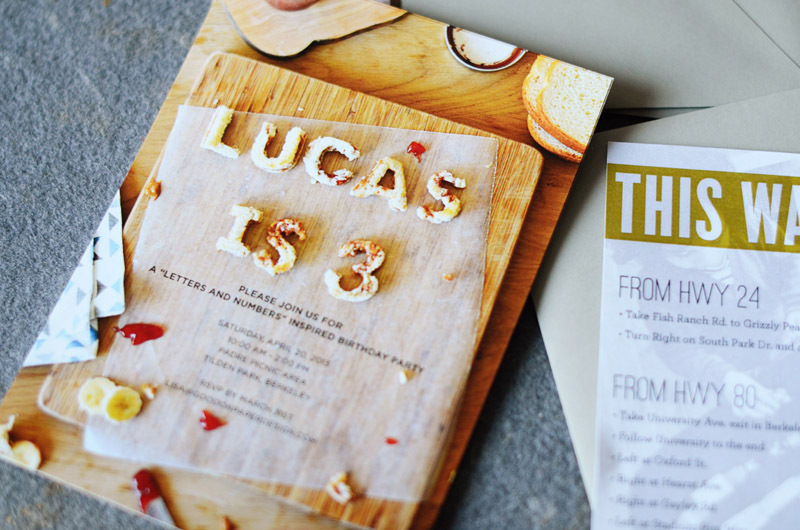 Lisa from Good on Paper always makes the most creative birthday party invitations for her son Lucas! First it was a circus-inspired invitation, then a hide-and-seek inspired invitation, and for his 3rd birthday she drew inspiration from Lucas’s current favorite: letters and numbers! 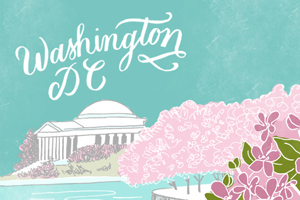 Lisa created the invitations using some inventive food styling and a few favorite photos of Lucas from this past year. Too cute! From Lisa: I had so much fun making these. Lucas has really been into reading letters and numbers on everything from books to license plates so this year we threw him a letters and numbers inspired birthday party. For the invitation I basically set up a mini photo shoot with words out of peanut butter and jelly sandwiches (another one of his favorites). It was super easy, fun and tasty. The gray envelope was custom lined using a recent favorite photo of Lucas “reading” a newspaper. I also designed custom wraparound address labels and a directions card with another photo of Lucas lining up his cars and counting them. Thanks so much Lisa! And happy birthday Lucas!